Bell 1 litre / 32 oz Quart Smooth Hi Shoulder. A beautifully shaped quart jar which lends itself to a range of uses including, but certainly not limited to, food preserving. The plain, unembossed sides make it ideal for putting your own label on the jar. 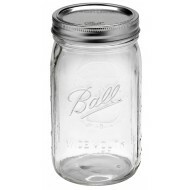 This model has high shoulders for a different visual effect to the standard quart jar. These jars can be used in hot fill or water bath / pressure canning with High Heat or two piece canning lids. Pesto / Jam Jars and Lids 150ml case of 20 Capacity with 53mm lidsBrand new 150ml round preserving jars with 53mm twist top lids in a 20 pack.&nbs..